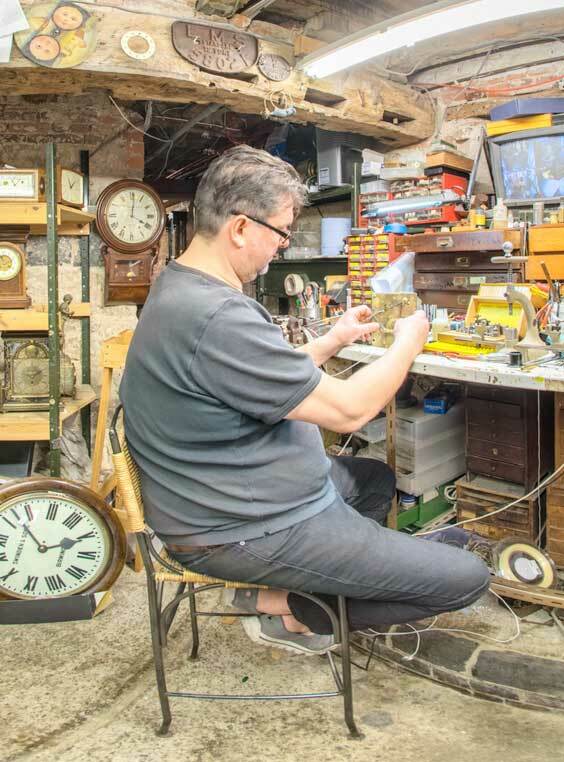 We undertake repair and restoration to nearly all types of clocks, watches and barometers. If spare parts are unavailable we have the expertise and facility to make components. We offer a good after repair service with advice on set up if necessary. Each repair carries a guarantee. We are one of Europe’s leaders in our trade and therefore are always extremely busy with repairs. Between our team of three clock movement repairers, we have a total of over 100 years experience! We can provide you with an estimate, free of charge. Due to the nature of our trade and the scarcity of horologists with such diversity, repairs can take any time between 1 week and several years, depending on the task. We recommend that a clock is serviced every 2 – 4 years to maximise its performance. If you bring your clock to R A James, at 48 St John Street, Ashbourne, Derbyshire (above Chimes Cafe at the back of Shawcroft Car Park)we will provide you with a verbal estimate for repair/service at no charge. » View More information on what a clock service involves. » View More information on clock case restoration and clock case repairs. » View More information on clock dial restoration, barometer dial restoration and watch dial restoration. » View More information on barometer restoration, mercury barometer repairs and aneroid barometer repairs. » View More information on our After Repair Back-up Service.